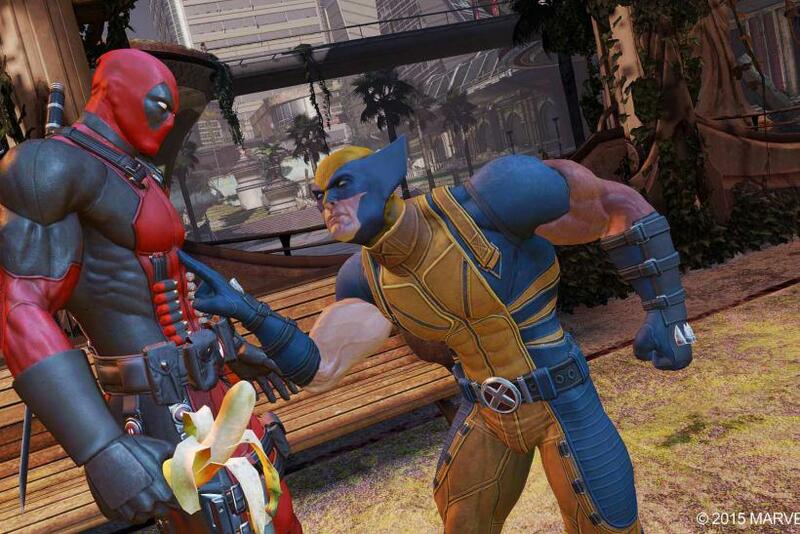 Deadpool has a conversation with an angry Wolverine in the "Deadpool" video game. Photo: Official press release from Activision. The “Deadpool” video game from Activision and High Moon Studios is now available on the PlayStation 4 and Xbox One. The title was originally released back in 2013 for the PS3 and Xbox 360, but is now available on current-gen consoles with a visual upgrade and all of the previously released downloadable content (DLC). As described from the game’s official press release, “Deadpool” is a “ top cut of gun-and-katana-seared action, drizzled with an aioli of maniac sass and quips.” In other words, it’s an action game with a mix of melee and long-ranged combat that also incorporates the comic book character’s humor, which many fans will be pleased to hear. The “maniac sass and quips” can be seen in the game’s launch trailer below, which PlayStation Lifestyle has described as “insane.” The video features appearances from various characters from the “X-Men” franchise, as well as dubstep music and explosions. For those not too familiar with the character, Deadpool is an assassin who is also trying to be a super hero and occasionally breaks the fourth wall. The character is mostly associated with the X-Men, thanks to his various encounters with Cable and Wolverine. In the “Deadpool” video game, the character’s fourth-wall breaking abilities are pushed to the limits, as he decides to make his own video game, after threatening High Moon Studios to help pay for it. The actual game has Deadpool teaming up with Cable, Wolverine, Rogue and others, as they take down long time foe Mr. Sinister. The game seems to have done the character plenty of justice, thanks to the aforementioned fourth-wall breaking and the characters numerous quips. This can be attributed to the involvement of long-time “Deadpool” writer Daniel Way, who wrote over 50 issues of the character’s solo adventures and also worked on the game’s script. “Deadpool” is now available on PS4, and Xbox One through retail and digital stores. The game is also available on the PS3, Xbox 360 and Windows PC via Steam, though the DLC is no longer available on last-gen consoles. Last-gen owners will also want to get a physical copy of the game, as it is no longer available on PSN or Xbox Live.